New Delhi: Swedish defence giant SAAB Group said today it would ensure "full" technology transfer of its Gripen-E fighter jet to India if the company gets the contract to supply a fleet of the single engine combat aircraft to Indian Air Force. The company also said it will build the world's most modern aerospace facility in India, besides creating a local supplier base of ancillary systems, if it wins the contract for which US defence major Lockheed Martin has emerged as a major contender. "SAAB is committed to full technology transfer to India in connection with Indian procurement of Gripen-E," SAAB India Chairman Jan Widerstrom said. Eyeing the multi-billion dollar contract, Lockheed Martin has offered to set up a production line in India for its F-16 Block 70 fighter jets. In September, SAAB and the Adani Group had announced a collaboration in defence manufacturing entailing billions of dollars of investment and said the joint venture would produce Gripen military jets in India if it wins the single-engine aircraft deal. "We will build the world's most modern aerospace facility and ecosystem in India. We will abide by the terms of the Strategic Partnership that would be set by the government for the single engine fighter aircraft programme and will undertake complete transfer of technology to the chosen joint venture partner," Widerstrom said in a statement. His comments came as government is all set to start the process for procuring the fleet of single-engine fighters. The fighter jets will have to be produced jointly by a foreign aircraft maker along with an Indian company under the recently launched strategic partnership model which seeks to bring in high-end defence technology to India. The SAAB said it will work with its Indian joint venture partners to ensure that transfer of technology takes place in a manner that it not only ensures transfer of technology but also complete capability. It said the company sees a green field operation where it will train people in India and in Sweden to be able to design, develop, manufacture and maintain its operations in India. "There will be a lot of training in Sweden and in India, and industry-academia-government cooperation. In that way we can reach an indigenous capability to maintain, to sustain, to further develop Gripen in India," said the SAAB India chief. He said, "We will not simply move an assembly line. We will build development capability. We will design, produce, support, innovate in India." Full tech transfer means 100% tech transfer. How is it possible for saab to transfer 3rd party tech like General Electric's turbofan engine tech.? It will be 100% of the 30% that SAAB control. Shekhar Singh, Hellfire, surya kiran and 4 others like this. Sounds similar to the Brazilian approach and that turned out to be pretty good for them. The question is, now that the Gripen E and F are already in development, what is left that they can offer for India to participate in design for example, or in which areas will they focus ToT on? That's marketing, nobody will or even can offer 100%, because ToT is mainly limited by governments. Angel Eyes and PARIKRAMA like this. Neither will give us engine ToT. But what Saab can offer us is ToT for radar and EW suite, which the Americans won't provide. Saab will be offering their own radar, not the Italian one. Angel Eyes, PARIKRAMA and Bali78 like this. At first I dismissed such report as another one of propaganda & refused to believe it. But then these sequence of events happened. The DoD prevailed upon key Democratic and Republican aides in the House Armed Services to remove the conditionality introduced by the Senate. The provision was part of the bill meant to finance the US armed forces for 2018 known as the National Defence Authorisation Act (NDAA). Now Pak was unsure that even if Hafiz Saeed was free to operate with inpunity, as long as its directed against India. what if USA at one side say we look the other way, what if USA tries to kill him secretly. Hence Pak played up “foreign intelligence agency” activated plan to kill him. In the letter, the National Counter Terrorism Authority said the foreign spy agency had paid Rs 80 million to two activists of a banned outfit for the assassination of Saeed. While the above secret handshake was going on, pak wanted assurance from USA that even though USA has put up a 10 million dollars bounty on Hafiz Saeed, USA will not send in Assassination crew. Objective was to get assurance from USA that it has not send in operatives & will not send operatives to kill Saeed. Which I believe USA gave informal assurances. 22/11/2017 Having got the assurance & Congress removing him from list - now Hafiz Saeed is free to walk free & continue his operations (business as usual). Its a open secret that the Pak military controls the Pak Judiciary. Ofcource no evidence was actually presented by Pak Govt to Court (so as soon as pressure is off, he could let go whenever pak desired. All the joint USA/India collected information of phone calls/GPS/Satellite phones evidence/David Headley & Ajmal Kasab confessions etc were conveniently never presented. While Pakistan has still not been removed from list of major non NATO ally, state sponsor of terrorism is far far away. Long story short - USA has once again proved it is not a reliable Partner & never can be. For all the lip sing on Global Terrorism.... For all those who believe we should buy 50 year old & obsolete & useless F16 & rely on USA, the above should be eye opener. Not to forget in case of war, these birds would most likely sit idle, till USA approves. Lets not even talk of LM refusal to share Tech or create an ecosystem of development/industry. I be damned if F16 come to India. I dont care be it more Rafales/LCA/MSA/Gripen/SU57 etc, just as long as no F16 etc comes to India. sunny6611, surya kiran, ashkum2278 and 10 others like this. New Delhi. 06 November 2017. No prizes for guessing the talk of the town if one hash tags aviation in India, make in India, indigenous aircraft production, final assembly lines, Indian Air Force fighters, joint ventures in Indian aviation and many more of them. The talk is – Who will bell the cat ? Will it be Boeing, Lockheed or Gripen? Will IAF’s next fighter to be made in India under the Make in India be F18A, F16 or JAS 39 Gripen E? Indian Air Force has come a long way since its days of dependency on first the USSR and then Russia for its needs. It is now a level playing field for all the players both national and international. But the strongest rumour today is that a RFI will be issued within this week to either Lockheed Martin or Saab. The two top executives of Lockheed Martin Abhay Paranjpe, Executive Director, International Business Development and Randall L Howard, Business Development Head for F 16 on their previous visit to New Delhi in a chat with ADU reiterated that they were waiting for the Indian Ministry of Defence to place the order under its new policy of Make in India and having a Strategic Partner and with 4,600 aircraft in 138 variants manufactured and sold to 27 countries, with sixteen repeat orders, they were confident of being India’s choice. With a coproduction agreement with Tata Advanced Systems Ltd (TATA) in place and the US Government is fully supporting the proposal in Government-to-Government (G-2-G) talks with the Indian Government the US aviation major is busy creating an ecosystem for themselves. Though they did not confirm but sources in Nasik have told ADU that the OEM is looking for and should also be very near to finalising a deal for purchase of about 200acres of land in the already existing aerospace hub there. Both Paranjpe and Randy unanimously felt that India should follow the US business model where a runway is shared by the US Air Force (USAF) and industry. It will not only help save costs, production and testing time but will also make supply chain management easier for suppliers will automatically want to have their units in the same area. The Nasik rumour seems logical with this argument as the HAL and IAF airfield already exists there. Abhay Paranjpe reiterated that IAF’s need for fighters is evident. “ Indian order should be for a minimum of 100 initially and a follow on order of a good number will not be a surprise. We along with TASL should be able to meet the requirement in the given deadline,” he stated. On being asked about the production rate per month he optimistically said that they should be able to produce 3 to 4 aircraft per month. Randall Howard informed that the F 16 Block 70 despite of being a new generation F 16 will also share some components and latest technologies of the F 35 to the extent of 70-75 percent. “The company will shift the entire factory and production line from Fort Worth in Texas to India if and only if we get selected by India. Periodic upgrades should be a part of the proposal. The manpower in India will be trained and skills development of the Indian workers and supervisors will definitely be our aim. The training can be here and if needed can also be given in the US facilities. All this will be decided only on the confirmation of getting the contract,” he said. “F16 is the most battle proven fighter and is a safe bet in the skies. We have a single supply chain, which means that the entire aircraft can be manufactured and assembled at one facility. Keeping in mind the huge market, India should be able to sell not just aircraft but also spare parts to other parts of the world, from its soil,” explained Paranjpe. Sancho and PARIKRAMA like this. All competitors will be confident of being shortlisted. BON PLAN, Angel Eyes and PARIKRAMA like this. How optimistic are you about winning the single-engine fighter jet order for Gripen E? We are confident that Gripen E meets the current and future needs of IAF with the additional advantage of being an aircraft that is at the start of its operational life. Gripen offers its customers a clear roadmap for future, effective and affordable air power. That is what sets it apart from any competitor. Gripen will give IAF the flexibility to tailor its response to the changing levels of threat, across the full range of defensive and offensive scenarios. Gripen will give India the freedom and power to act as required to safeguard its interests. We believe that India is in need for an aircraft like Gripen. What is your plan for Gripen E under the ‘Make in India’ program for defence? We have a blueprint for a comprehensive ‘Make in India’ program, which will include the setting up of manufacturing and maintenance facilities; transfer of state-of-the-art technology; setting up of an aerospace ecosystem in India; creation of a local supplier base of ancillary systems; and employment of a well-trained Indian workforce. We will build the world’s most-modern aerospace facility and ecosystem in India. It seems that the issue of full transfer of technology (ToT) has become a stumbling block for the OEMs under the Strategic Partnership policy of India. What is your stand on this? There is no issue on transfer of technology, and we will abide completely by the terms of the Strategic Partnership policy of India. We have always consistently communicated to the government that we will abide by the terms of the Strategic Partnership that would be set for the single-engine fighter aircraft program, and will undertake transfer of technology to the chosen partners. Are you willing to go for 100 per cent ToT on Gripen E? SAAB is fully committed to technology transfer to India in connection with the Indian procurement of Gripen E in accordance with the Strategic Partnership model. With more than 50 per cent of the components in Gripen E having American content, how difficult will it be for you to go for full ToT in terms of approval? There is no difficulty. When we talk about full ToT, we are talking about enabling transfer through the value chain, including all our suppliers. In fact, recently, we have started the process of enabling Gripen’s major suppliers, including the American firms, to meet with potential Indian partners. We see the transfer of technology as a seamless process between ourselves and our supplier partners. We are not aware of any such re-think. India has a large requirement of fighter aircraft. There is a significant gap between current numbers of operational aircraft and the objective, plus a large number of fighter aircraft will be retiring from service in the next 10 years. The former defence minister, Manohar Parrikar, had said that India would have 120 operational Tejas aircraft in 2025, but this number alone is not enough to satisfy the shortfall. The only way forward is the acquisition of single engine aircraft after accounting for Tejas, Rafale and other fighters already under contract. IAF has made it clear that they will need the single-engine fighter jets over and above the Tejas LCA [Light Combat Aircraft]. Does it come as a glimmer of hope to you? We see Gripen as a complement to LCA. India has a large requirement for fighter aircraft. The Tejas is on its way to induction, and as we understand the Air Force’s fighter requirements, India requires a mix of fighter aircraft to meet requirements and numbers that cannot be met by Tejas alone. It has built the foundation for India’s aerospace industrial development in the last couple of decades. Gripen will not replace LCA – it will built on that foundation – and take it to somewhere new. There will be a wave of future technologies, some of them developed in India, that will be integrated into India’s fighter platforms, led by Made-in-India Gripen aircraft. This will be the next generation of aerospace development in India. There will be shared technologies between Gripen and LCA, with common resources, the same suppliers in many cases. Both LCA and Gripen will gain from this. India has a vision to export LCAs to friendly nations. Our view of India’s aerospace industry development will enable Indian suppliers to scale up to meet this vision. And that is the Swedish view of partnership. How do you plan to make India into an export hub for Gripen E? Our India facility will act as a regional hub for SAAB, and will produce aircraft for export to the world in the coming decades. Our Indian suppliers will also become an integral part of our global supply chain. Sancho, W@rwolf and PARIKRAMA like this. When we talk about full ToT, we are talking about enabling transfer through the value chain, including all our suppliers. In fact, recently, we have started the process of enabling Gripen’s major suppliers, including the American firms, to meet with potential Indian partners. We see the transfer of technology as a seamless process between ourselves and our supplier partners. We see Gripen as a complement to LCA. Some people just don't want to believe this fact!! It's very generous of Saab to be offering technologies that aren't theirs to give. It's even more generous given how the one country that can effectively veto this transfer is also the country that is pushing the Gripen's only competitor in this not-yet-a-tender. Bali78, Picdelamirand-oil, BON PLAN and 1 other person like this. The best response by an old Indian lady, on the flip flop by US on TOT promised by the Americans / Potus for the single engine F-16. And that's how they won in Brazil, with the best ToT offer. Because the key is not how much techs you own, but how much you are ready to transfer. Transfering 100% from the 30% you own, is more than transfering 20% of 100% you own. migflug, LonewolfSandeep, cannonballs and 5 others like this. The question is how many non Sweden and Brazil flags do you see here and how many of those non Swedish and Brazilian ones can be replaced with Indian and EU? When it comes to ToT, Intent is more important than capability and financials. Sancho and LonewolfSandeep like this. India, which intends to replace all of its Russian-made MiG-21 and MiG-27 fighter jets by 2024, is stuck in a difficult situation, as Lockheed Martin has denied total transfer of technology, SAAB itself lacks complete technology and local firm HAL is incapable of delivering at the required pace. New Delhi (Sputnik) — In a rude shock to India, which has been preparing to issue a global tender for single-engine fighter jets, America's Lockheed Martin, considered a front-runner for the deal, has announced that it will not guarantee total transfer of technology if it is awarded the $10 billion contract. This has added to the woes of India's defense ministry that is already in the eye of a storm for failing to convince Dassault Aviation of France to transfer the technology for the multirole Rafale fighter aircraft. "It will never be full transfer of technology. It is not in the national interest or industry's interest. Certain technologies are not transferable to anyone in the world," Keith Webster, senior vice-president of Defense and Aerospace, a US-India Strategic Partnership Forum (USISPF), said in an interview with The Hindu Business Line on Tuesday. The American F-16 and Swedish Gripen are the main contenders in the prospective deal of 114 fighter aircrafts, in which India intends to purchase 10 in flyaway condition, and the rest will be manufactured in India at a facility set up by the winning firm. "Only a handful of aviation players have the main technologies in terms of radar, engines, stealth, EW systems, etc. India is the largest market and it is also an emerging power. No one would want India to become independent on this count," Air Marshal Anil Chopra (retired), a defense analyst told Sputnik. Swedish SAAB has promised full technology transfer of its Gripen-E fighter. However, Gripen is not India's first choice as SAAB itself imports most of the components from elsewhere. Meanwhile, the fighter jets being locally developed in India still have a lot to be desired in terms of radar, engine and EW system. The Indian Air Force has thus far inducted five Tejas light combat aircraft (LCA) on initial operational clearance. The Indian Air Force has ordered 20 additional aircraft after the final operational clearance. However, the Indian Air Force is not much satisfied with the progress made in the development of the aircraft by the state-owned manufacturer Hindustan Aeronautics Ltd. This is being viewed as a major reason behind the Indian Air Force's delay in placing the order for 83 of HAL's superior Tejas MK-1 fighter aircraft. "India must make all efforts for LCA to succeed. Take help of radar, engine and EW systems," Air Marshal Chopra added. Even if everything goes according to the promise made by HAL, it can deliver 16 Tejas Mark-1A per year and the induction of all 83 will be complete by 2028. 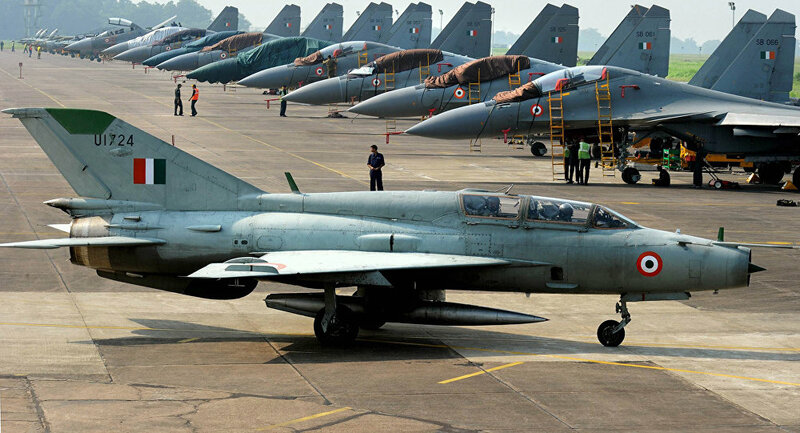 However, the number and pace of delivery would not be enough, as the Indian Air Force has set a target to replace all 11 squadrons (18-20 fighter jets in a squadron) of its Russian-made MiG-21 and MiG-27 aircraft by 2024. "To cater to delays and performance shortfall, India must buy single-engine aircraft and arm-twist at least all of the low-end systems it currently has," Air Marshall Chopra concluded. But will this change the dwindling strength of the Indian Air Force? "Seems unlikely, as we [have] already [fallen] behind a decade due to indecision," a senior Indian Air Force official told Sputnik. Sancho and BON PLAN like this.